Kentucky coffeetree (Gymnocladus dioicus) is increasingly becoming one of my favorite landscape trees. It is tough, including in calcareous soils. It has a stark appearance that really works in the winter street tree environment, with fluted, sparse branching (the genus name of Gymnocladus means “naked stems”). It was once, for almost two decades, the state tree of Kentucky, yielding to the prior and now present Kentucky state tuliptree. It is in the Fabaceae (bean family), and its lima-bean shaped seeds were used by Native Americans and European settlers as a coffee substitute. It is reputed to be a poor substitute for Coffea arabica and C. canephora, which we think of as true coffee, but which are not true beans, Coffea being a genus in the Rubiaceae, rather than the Fabaceae. Seeds of Kentucky coffeetree are toxic to humans and some animals) unless roasted. Kentucky coffeetree fruts with maturing dark, seeds inside. Roast well if going to use for coffee. Kentucky coffeetree is a native tree that is planted as a tough urban survivor in streetscapes, and as noted is tolerant of limey soils and tree pits (Chicago urban foresters once listed it as one of their five toughest street trees). It has a starkly coarse yet beautiful appearance and its fairly early fall defoliation and late spring foliation make it perfect if long seasons of sun penetration are desired. The bipinnately compound leaves are huge, from 1-3 feet long, though the axillary buds that prove that the elaborately branching foliage is of such long multi-leafleted leaves are tiny and sometimes difficult to find amongst woolly hairs in the leaf axils. Though that winter appearance is stark, the bipinnately compound leaves give the tree a feathery appearance in the growing season. The seeds are beautiful and were used for games and as jewelry by Native Americans, and by me as I roll the seeds in my hands like Captain Queeg in The Caine Mutiny. The seeds are shiny bright lima bean-like green early, but deepen to a hard texture and turn coffee-brown color as they age. Kentucky coffeetree bark is ridged, wood is used in cabinetry, fall color is yellow. Plant one or a group as specimens for the winterscape. I noticed the greenish-white flowers for the first time this spring and reading that Kentucky coffeetree is dioecious and that pistillate flower racemes are 8-12 inches long, I suspect that flowers I saw were from a female tree. Will pay more attention next May. 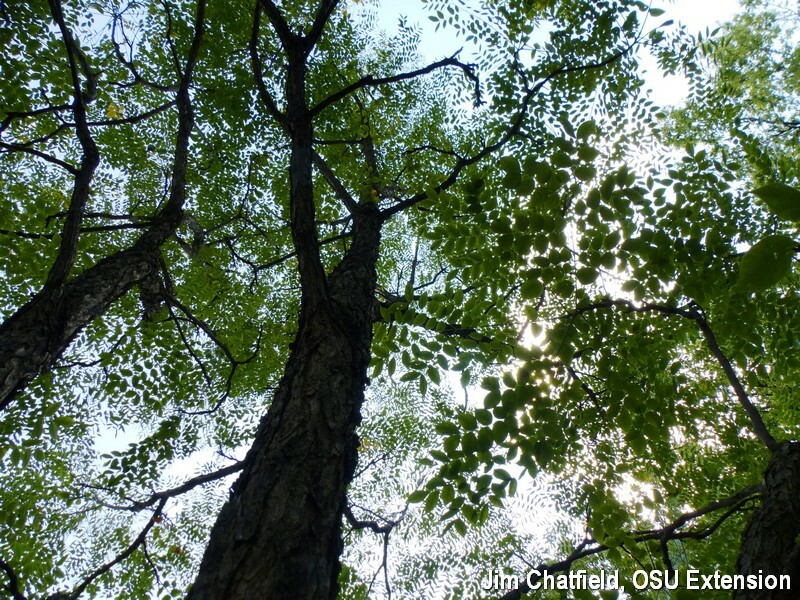 Though Kentucky coffeetree is native to the Midwest and near South U.S., it is being used further west. My daughter, her husband, and new granddaughter (oh, how much fun being a grandparent is) just picked a street tree for their yard in Denver, and it was a Kentucky coffeetree. Great choice; growing healthily in the park by their house.